This website presents the work of Henry J. Hardenbergh, a leading turn-of-the-20th-century architect. Famed for designing the Dakota and the Plaza Hotel, he also designed many fine buildings that aren't as well known but still add touches of flourish here and there within the city and region. Fortunately, his artistry was built on structural strength that has endured for generations. "Hardenbergh designed buildings for long-term use, not short-term profit," Christopher Gray wrote in The New York Times in 2000, "and his insistence on heavy, conservative masonry designs increased his reputation for dependable solidity." Readers of this website and I have managed to identify more than 100 buildings he designed that still stand. The ones I've been able to photograph are presented here, roughly in the order they were built, for inspiration or simply for enjoyment. The 13-story John Wolfe Building, built in 1895 on the east side of William Street from Maiden Lane to Liberty Street. This narrow and stepped building in the Flemish style, considered to be an innovative way to solve various problems of the early skyscraper, was demolished in 1974 for an ill-conceived street widening plan. The site is now part of a glorified traffic island called Louise Nevelson Plaza. An eight-story building for the Western Union Telegraph Company at 16-18 Broad Street, built in 1883-1885. This was built at the same time as another building Hardenbergh designed for the Western Union Telegraph Company that survives at 23rd Street and Fifth Avenue. The Broad Street building was demolished in 1901 to make way for its expanding neighbor, the New York Stock Exchange. The six-story, Bavarian-style Astor Building at 10 Wall Street, built in 1885 and demolished c. 1930. The Mail & Express Building across Fulton Street from St. Paul's chapel. This was built in 1891 and demolished in 1922 to make way for W.W. Bosworth's AT&T Building at 195 Broadway. (The before and after photographs appear on pp. 6-7 in the classic New York Then & Now). The eight-story London & Lancashire Fire Insurance Co. Building at 57 William Street. This site is now occupied by Chase Manhattan Plaza, built 1957-1960. A six-story brick, stone and terra-cotta office building built in 1893-1894 at 136-140 Front Street, from Pine Street to the now-decomissioned Depeyster Street, a block away from Hardenbergh's more subdued New Jersey Zinc Co. Building, which still stands. A two-story taxpayer at 100 Washington Street (between Rector and Carlisle Streets) built in 1908 by F. Augustus Schermerhorn. A warehouse and glass factory on West 23rd Street for the Dominick & Haff Co.
A four-story brick townhouse built for one J.H. Gantier in 1883-1884 at 28 Fifth Avenue, between West 9th and 10th Streets. It was demolished in 1923 to make way for a 15-story apartment building. The original Waldorf Hotel, built in 1891 at the northwest corner of 33rd Street and Fifth Avenue and demolished in 1929 to make way for the Empire State building. The original Astoria Hotel, built in 1897 at the southwest corner of 34th Street and Fifth Avenue, connected to the Waldorf to form the original Waldorf-Astoria Hotel, and demolished in 1929 to make way for the Empire State Building. The Manhattan Hotel at the northwest corner of 42nd Street and Madison Avenue, built in 1896-1897 and demolished in 1961 to make way for the 41-story office tower at 330 Madison Avenue. The Van Corlear (1880), a six-story early apartment building mixing the Queen Anne and Dutch styles that stood on the west side of Seventh Avenue from 55th to 56th Streets. This building, demolished c. 1925, helped to set the example for which future apartment buildings were built: "the building enclosed a large central courtyard with sufficient dimension in relation to the height to provide adequate light," Richard Plunz wrote in A History of Housing in New York City. The Wyoming apartment building at the southeast corner of Seventh Avenue and 55th Street, across the avenue from the Ontiora and a block down from the demolished Van Corlear. The Wyoming was demolished in 1906 to make way for a new Wyoming apartment building designed by Rouse and Sloan that still stands. The Willkie Memorial Building, earlier the New York Club, on West 40th Street. A carriage factory and warehouse built in 1891-1892 for one H.A.C. Taylor on the north side of West 51st Street from Seventh Avenue to Broadway. The building was converted into a dance hall, stores and offices in 1922. It was demolished in 1957, its site serving temporarily as a parking lot before the construction, in 1961-1963, of a 21-story hotel occupying the full block. A nine-story brick, stone and terra cotta apartment building at 341 Madison Avenue (at East 44th Street). Now, a 1920's era office building on the site keeps the width and depth of Hardenbergh's building but increases the height. A "big" townhouse at 12 East 56th Street, where Hardenbergh himself lived for a while. This is also the address where his wife, Emily Irene Keene, was said to be living at the time of their marriage in June 1893. A one-story Plaza Hotel operations office at 13 West 58th Street, on the site now occupied by Warren & Wetmore's 1921 addition to the Plaza. The Third Avenue Elevated Railway Carbarn (1896) taking up the full block bordered by East 65th and 66th Streets and Second and Third Avenues. It was demolished c. 1951 to make way for Manhattan House. The seven-story Adelaide Apartment House (1887) at the southeast corner of Park Avenue and 66th Street. This featured beautiful two-story gables in the vein of the Dakota and the Plaza. It was replaced in 1912 by 635 Park Avenue. A cluster of 11 townhouses at the northeast corner of Lexington Avenue and 89th Street. These were demolished in 1959 for an apartment building. These houses are said to have been more visually exciting than the ones that survive across the street as city landmarks. Ten rowhouses at 21-39 West 73rd Street, built in 1882-1885 as part of a row of 28, 18 of which remain standing. These 10 were demolished in the early 1925 to make way for the Park Royal, a 16-story apartment building. Twenty-four rowhouses at 105-151 West 73rd Street, built in 1879-1880 as part of a row of 25, of which only No. 103 remains. The others were demolished between 1917 and 1920 for two apartment buildings, 105 and 115 West 73rd Street, a telephone company building at 121 West 73rd Street, and Project FIND's Hamilton House at 141 West 73rd Street. An ornate four-story stone townhouse at the southeast corner of Fifth Avenue and 80th Street, a site now occupied by 988 Fifth Avenue, built in 1925. The Van Norden Trust Co. Building, an ornate nine-story apartment buiding at 787 Fifth Avenue, at the southeast corner of 60th Street, built in 1903 and demolished c. 1961. This featured a two-story mansard roof with porthole windows like the Willard Hotel's and 26-foot tall Ionic columns at the base. A four-story brick and brownstone townhouse at 911 West End Avenue, between West 104th and 105th Streets, built in 1892-1893 for one M. Mitchell. It was demolished in 1922 to make way for a 15-story apartment building at 915 West End Avenue. Two five-story tenements with ground floor retail at 1291 and 1293 Second Avenue (between East 67th and 68th Streets). A two-story taxpayer built in 1901 by the New York Trade School on First Avenue between 67th and 68th Streets. The Raleigh Hotel, at the northeast corner of Pennsylvania Avenue and 12th Street, NW, in Washington, D.C. 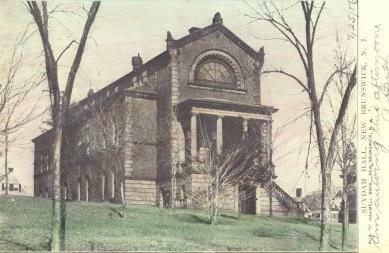 It was built in 1911 and demolished in 1964. The old Palmer Stadium (1914) at Princeton University, demolished in 1998 because of failing concrete. Haste makes waste. According to the August 1989 issue of Princeton History, "It was rushed to completion in six months to be ready for the Yale game. Because, when it was built, knowledge of the nature of reinforced concrete was imperfect, the structure has expanded and contracted and required constant alterations and repair." Note, however, that the first and last games played in the stadium were against Dartmouth. The New Brunswick Theological Seminary's James Suydam Hall, 17 Seminary Place, New Brunswick, N.J. This was built c. 1873 and demolished in 1965. A six-story Romanesque-Revival warehouse built in 1893 at 421-427 Arch Street (between North 4th and 5th Streets) in Philadelphia. At the turn of the century, this building housed space for The Ladies' Home Journal. 14 West 23rd Street was converted from a brownstone into a retail building by Hardenbergh in 1882. But in 1892, the present cast-iron facade, designed by George H. Billings, was installed. Hardenbergh didn't design the original building, nor its current exterior. A neo-Gothic, neo-Romanesque building at the southeast corner of Broadway and 57th Street was originally two adjoining buildings designed by Francis Hatch Kimball until they were combined by Hardenbergh in the months before he died. It is unclear whether any visible exterior elements might be attributable to Hardenbergh. These pages are maintained by Aaron Donovan. If you have questions or information about any of these buildings or any that ought to be included, please e-mail me at startsandfits@gmail.com.